Achieving optimal storage performance means getting the basics right, as well as knowing which latest storage technology to choose for your organisation’s workloads. That means getting fundamentals like LUNs and RAID right, but also knowing how to fine tune your storage for particular workloads, and knowing which emerging storage technologies can help speed access to key data. 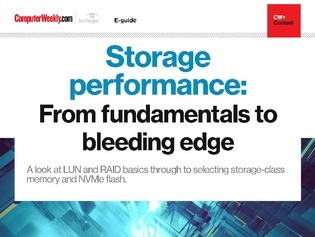 In this guide we look at LUN provision and management, RAID and flash storage, plus tuning for analytics workloads and key emerging technologies that can give your organisation a competitive advantage in mission-critical operations, such as storage-class memory, NVMe flash and persistent memory.